The time interval between the first and last instants at which the instantaneous amplitude reaches a stated fraction of the peak pulse amplitude. Also known as pulse length; pulse width (both deprecated usages). The nominal duration of a standard pulse, which is the time interval between the half-amplitude points on the rise and the decay points of the curve. It is the measurement of the pulse transmission time in microseconds (i.e., the time the radar's transmitter is energized during each cycle). For the pulses of other shapes, the points on the curve must be stated. 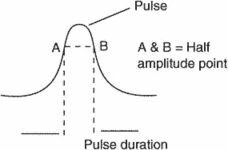 Also known as a pulse length or a pulse width.